Gabriel was born and raised in South East Anatolia Turkey and the first of six languages in which he is fluent is a modern dialect of Aramaic (known as Turoyo or Surayt). He holds a Bachelor and Master’s and DEA degrees in ethnomusicology and Middle Eastern Music from the Holy Spirit University of Kaslik-Lebanon. He holds another master’s from Yale School of Divinity and Institute of Sacred Music. He is a PhD candidate in ethnomusicology focusing on Syriac Sacred Chant. He is the founder and director of the Institute of Syriac Sacred Music in Rhode Island. He composed music for several documentary films such as the Turkish documentary film titled “Yarina Bir Harf (A letter for tomorrow) and “Syriac People, Eastern Christians” for a Slovenian TV station. He released a Syriac CD titles “Nusrotho.” He also composed the music for Multi-media compendium of 75 stories from both the Old and New Testaments for “Children’s Bible.” He is currently publishing the first official hymnal according to the rite of the Syriac Orthodox Church of Antioch, entitled “Zmirtoho d’ito Bnoṭa/Syriac Hymnal”. 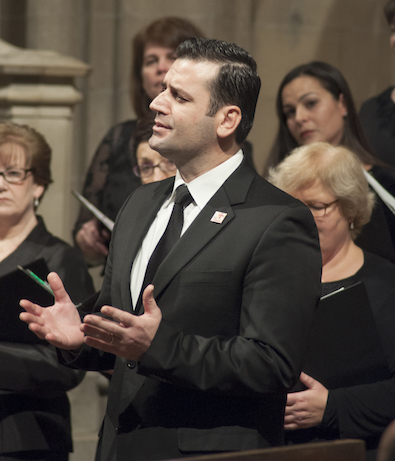 He trains choirs of the Syriac Orthodox Church for the Eastern United States.